Or has technology simply made immoral acts more accessible and easier to do? Is technology empowering people who would ordinarily not commit immoral acts to do so “with a click” and digital impunity? Consider Fiverr, an Israeli company funded with $50,000,000 from Silicon Valley’s Accel Partners and Bessemer Venture Partners. Fiverr is a marketplace that provides access to creative and professional services. Fiverr has extended the “new morality” to “cheating” in school. 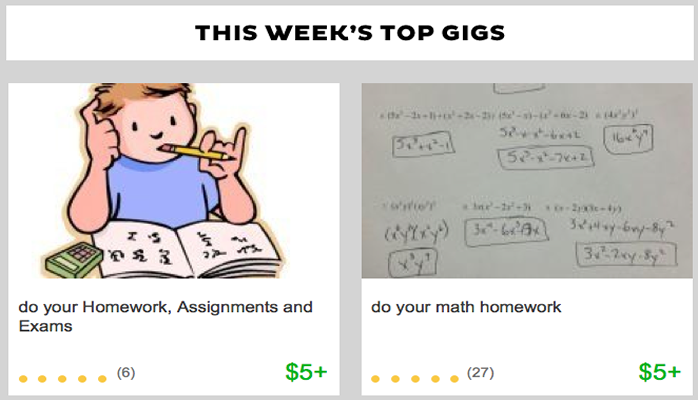 Cheating on schoolwork is now a “Top Gig” at Fiverr – for just a click and a mere $5. Today’s “This Week’s Top Gigs” e-mail from Fiverr was devoted to outsourcing homework, tests, and exams. Who does this? Parents for their kids? Adults for themselves? Is this evidence of a “new morality” in Silicon Valley? And why target me with this ad? Does Fiverr think I would pay someone to do my kids’ homework or take their tests – or do the same for myself – because I live in Silicon Valley? Is there nothing wrong with this?